The Alienware Aurora R6 is an excellent gaming PC that offers brilliant performance in a nicely-sized compact body. The price is pretty great as well, considering the power on offer. Over the years, Alienware has built up a reputation for building large, powerful and expensive gaming machines, yet its Aurora range of gaming desktops boast compact designs and more reasonable prices – all while maintaining Alienware’s hard-won standing in the gaming community. The Alienware Aurora R6 looks set to continue that tradition. The Alienware Aurora R6 sits between Alienware’s Alpha range of affordable and compact PCs and the high-end Alienware Area 51. While this puts the Aurora R6 in the mid-range of Alienware’s offerings, don't be fooled into thinking this is simply a middle-of-the-road gaming machine. It combines everything we expect from Alienware’s products, including powerful components and an eye-catching design – culminating in one of the best gaming PCs you can buy today. 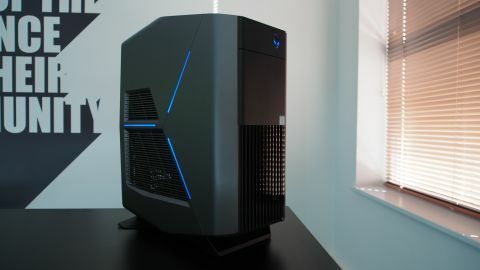 As is customary with Alienware gaming desktop PCs, the Aurora R6 comes in various configurations. The lowest-price version comes with a 7th-generation Intel Core i5-7400 processor, 8GB of DDR4 RAM and an AMD Radeon RX 560 GPU, and costs $799.99 (£849). In Australia, the lowest specced Aurora R6 is slightly different, coming with an Intel Core i7-7700 processor, 8GB RAM and an Nvidia GTX 1050 Ti for AU$1,799. Meanwhile, at the top of the range is a model with an Intel Core i7-7700K processor, 64GB of RAM and two GTX 1080 Ti graphics cards in SLI. This model is US-only, and costs $3,799.99. The top-of-the-line Alienware Aurora R6 in the UK comes with 16GB of RAM and a GTX Titan X graphics card for £2,599. In Australia, the top-end Aurora R6 features virtually the same specs as the UK model, but with a GTX 1080 graphics card, for AU$2,999. All of those prices include delivery. The version we got in for testing sits around the upper-middle of the range, and comes with an Intel Core i7-7700K CPU, 16GB RAM and GTX 1080 Ti. It’s available on the US Dell Store for $2,249.99 (around £1,700, AU$2,800). That exact configuration isn’t available in the UK or Australian Dell store, but we have contacted Dell to find out exact prices. Not only is there a large range of configurations available, you can also upgrade and change components on the website before you buy, which gives you a huge amount of flexibility for creating an Aurora R6 PC that perfectly suits your needs and budget. Unfortunately, the Alienware Aurora R6 has been discontinued by Dell at the time of this writing. However, you can still find it online. For instance, you can pick it up on Amazon in the US for $1,366 (about £1,032, AU$1,846) with a Core i5-7400, GTX 1060 and 8GB of RAM. Think gaming desktop PCs – especially ones made by Alienware – are huge black monoliths that tower above you and dominate your desk? Think again – as the Aurora R6 comes in a specially-made mid-tower, which makes it pretty small as gaming desktops go, with a height of 472.52mm, depth of 360.5mm and width of 212mm. The size is kept down thanks to what Alienware describes as its ‘zero-fat design’, which cleverly packs the components – including dual GPUs and water cooling if you go for those configurations – into a clever space- saving design that also ensures there’s plenty of airflow to keep the components cool. This is achieved by vents and intake fans on the front and right of the case, with an exhaust fan pushing hot air through vents situated on the top of the chassis. It also comes with a tool-less design, which should in theory make installing some components, such as graphics cards, easier when you want to upgrade. It’s a nice thought, and our quick peek into the insides of the Aurora R6 revealed a tightly-packed, yet still accessible, range of components. The inside layout of the Alienware Aurora R6 is pretty unique, with the power supply mounted to a metal arm that swings out of the case, giving you room to add components. Other design considerations, such as placing the hard drives at the bottom of the case, are good ideas that helps the Aurora R6 maintain its small size. At the front of the case are four USB 3.0 ports, with four more at the rear, along with six USB 2.0 ports and a USB-C port, which gives you a generous amount of connectivity. You also get an Ethernet port, and a 3.5mm jack and optical digital out for sound. The video outputs will vary depending on what graphics card comes with the model of Alienware Aurora R6 you buy. While the case is rather restrained looks-wise compared to other gaming PCs it still features RGB LED lighting – a mainstay of gaming products these days, allowing you to choose the colors and patterns of lights in and around your PC. Alienware’s AlienFX technology powers the LEDs, and it can be customized to react to in-game events, as well as showing solid colors or patterns. On the whole it’s a nice setup that adds an extra element of visual pizzazz without looking too garish, and the amount of customization thanks to the AlienFX software makes it easy to get the look you want. Overall we were very impressed with the compact design of the Alienware Aurora R6, which manages to pack some very powerful components into a small and attractive package, while keeping everything running nice and cool. It also gives you scope to upgrade and replace components in the future. Unlike many other gaming desktops, the Alienware Aurora R6 comes with a keyboard and mouse included, so that's two major components you don’t need to worry about purchasing separately – you just need a monitor. And if you already have a mouse and keyboard that you couldn’t game without… well, at least you'll have some spares. As far as mice and keyboards go, the ones included with the Aurora R6 do a solid job, although they can’t compete with mechanical keyboards and specially-designed gaming mice. Both are branded with the Alienware logo, so they look the part next to the desktop.